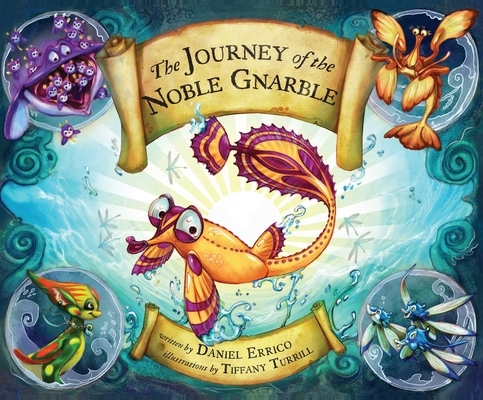 Having no kids of my own, it's pretty rare that I find a picture book and think “I NEED this book in my life,” but that's exactly what happened with The Journey of the Noble Gnarble. I'm buying this book for every kid I know. It is written in a way that easily recalls both Dr. Seuss and Lewis Carroll and tells a heartwarming story of a little Gnarble determined to follow his dreams despite being told by everyone he knows that it's impossible. The fantastical world of the story is beautifully illustrated by Tiffany Turrill in amazingly detailed, bright, full-page illustration. If you like this one you should also pick up The Journey of the Marmabill, another gorgeous picture book by this duo about a Marmabill finding the courage to take back her home. The gnarble wants nothing more than to swim up above the waters to see the blue sky, but gnarbles don't have flappers like blyfish do, and gnarbles don't even have koggers like the swimming gungaloo! But though gnarbles never swim so high, this particular gnarble is determined to see the sunlit sky. He swims past spongy gishy-gosh and feeding fipple-fosh, but who would think the little gnarble could pass the hungry warckel, subbaubble, and—most dangerous of all—the evil plink?! Daniel Errico's charming nonsense rhymes and Tiffany Turrill's vivid, expressive iillustrations combine beautifully in this entertaining story of a little fish on a big mission. Kids will giggle aloud at crazy creatures with names like gishy-gosh and glimmy glins; parents will love snuggling up with their children to read about the little gnarble's escapades in this wacky world of silly sea creatures. Join the little gnarble on his unforgettable journey from the ocean floor to the shining sun!